Hi Rosa. Thanks for talking to us. Could you start by describing your research, for the layman, in ten sentences or less? So, everyday products that we use as part of our routine – for example cleaning products, fuels, medicine, even food – have a negative impact on the environment. This is because all the activities that go into making these products involve the extraction of raw materials, energy consumption, there is transport involved, and waste is generated as well. All these activities, that we call part of the life-cycle of products, will have a negative impact. But making a product more environmentally friendly is not an easy task because you have other economic and social aspects behind them. Part of my research is to find the right balance between these three sustainability pillars, to make sure that whatever alternative we come up with has a more environmentally friendly impact on our environment. But also takes into account the social and economic aspects of it. Fantastic, thank you. Could you tell us a bit more about how your research can benefit the public? 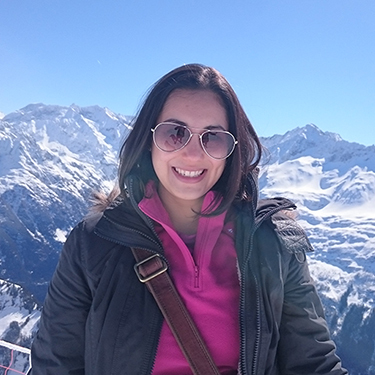 As chemical engineers I believe we have a big responsibility to make products and processes more sustainable and that’s one of the reasons I came to Manchester to do an MSc in Environmental Technology – to find out more about the engineering application of sustainable development. And I was lucky enough to get to work closely with leading experts in sustainability. One thing led to another and I really got into this research area that I now really, really enjoy. Well my favourite subjects in school were Maths, Chemistry, and Physics! I was always very curious about how things were made and understanding physical phenomena. So I thought becoming an engineer was the right path for me. 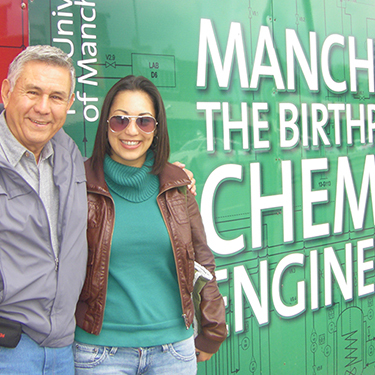 Rosa and her father in Manchester, the birthplace of chemical engineering! But the person who really inspired me to become a chemical engineer was my dad. He’s a chemical engineer and he’s always been really passionate about it, so I grew up listening to all these really exciting stories about the workplace. And I guess I wanted to live that myself. He taught me to see the world in a very practical way and it’s something that I really, really enjoy about life. That’s a lovely answer, Rosa – thanks for sharing that. Moving away from work for a question, could you tell us a bit about your other interests? What do you get up to in your spare time? I have many interests outside work. One of them is oil painting – it’s something I’ve been doing since the age of four. 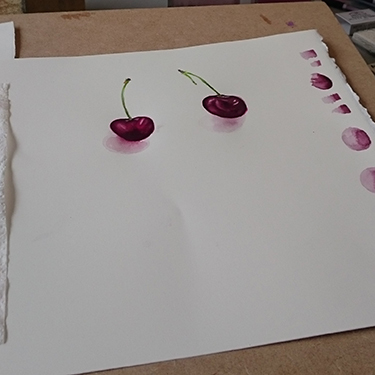 And I’ve recently taken water colour lessons, and I found it to be really challenging but relaxing at the same time. So I do enjoy painting. I also like to read and go to the cinema, or go to the ballet. And I like to travel. I recently went to Switzerland, to visit some friends. And we went to the Swiss Alps to see the snow. The first time I’d ever seen proper snow! That was a very beautiful place to visit. Thanks, Rosa. Time for the last question. Can you tell us how being here in Manchester helps your work and research? Well, being in Manchester definitely gives you a big advantage because you get to work with world-leading experts and interact with them on an everyday basis. So that’s really helpful, especially for an early career academic like me. And also the geographical location. We’re at the heart of an industrial city and that’s very important for our research because it helps us to make the bridge between the academic work that we do here and the application in real life. So having industry involved, and being close, is a great advantage. Brilliant – thank you, Rosa. It was great talking to you and hearing about the exciting research you’re working on. Best of luck with it all. Readers, thanks for joining us once again. Keep your eyes on the blog; there will be more interesting stuff to come in the near future. And if you want to find out more about the world of chemical engineering here in Manchester, please just head to the website.